(10147, Oklahoma Historical Society Photograph Collection, OHS). (13646, Luther Bishop Collection, OHS). Prior to 1907 statehood, Oklahoma and Indian territories (the Twin Territories) had different liquor policies. Oklahoma Territory (O.T.) laws permitted the sale of alcohol, but in Indian Territory (I.T.) federal laws prohibited the distribution of intoxicants. For more than a decade before statehood, the powerful Anti-Saloon League (ASL) and the Woman's Christian Temperance Union (WCTU) forces waged war against the legalized sale of liquor in O.T. and called for stricter enforcement in I.T. As statehood neared, prohibitionists, with Protestant churches as their key support, flexed their political muscle to select Constitutional Convention delegates who would frame an antiliquor law into the new state's constitution. 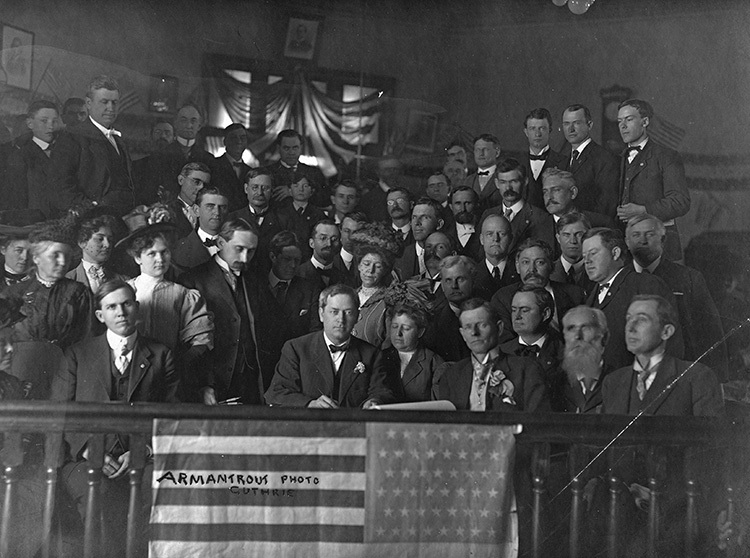 Antiliquor or "dry" proponents also won a significant victory when the federal government not only provided for single statehood in the 1906 Oklahoma Enabling Act but also mandated prohibition in I.T. for twenty-one years. The act permitted Oklahoma to establish a "dispensary" or liquor agency to handle the sale of alcohol for "medicinal" purposes. With an upper hand at the Constitutional Convention, prohibition forces wanted to make the entire state "bone dry." They found a skillful champion for their cause in Charles N. Haskell, one of the convention leaders and future governor. Although proliquor groups ("wets") such as the Citizens League tried to convince the delegates of the revenue value of liquor sales, they encountered difficulty in counteracting the ASL and WCTU. Wets faced a stiff challenge in overcoming the organized campaign of drys in the territories and the strong antisaloon sentiment spreading across the country during the late nineteenth and early twentieth centuries. On September 17, 1907, future Oklahomans accepted prohibition as part of the new state's constitution. Drys achieved their immediate objective, and they made repeal of prohibition more difficult for subsequent generations to overturn by writing prohibition into basic law. Upon taking office, Charles N. Haskell, the state's first governor, reiterated his support for strong enforcement, and he placed on notice anyone "'within our borders disposed to violate [the law].'" Subsequent Oklahoma governors would make similar statements, but they would achieve no better enforcement record than Oklahoma's first chief executive. Between statehood and the 1930s Oklahoma's rural, Protestant landscape provided a healthy environment for prohibition as a social experiment. The Billups Law, passed in March 1908, provided for a dispensary system, and a few Oklahomans became "ill" enough to request "prescription" medicine from the dispensary. Governor Haskell strongly defended this outlet for liquor. It was not a "'barrel of whiskey with the head knocked in and a tin cup hanging conveniently near.'" Despite the governor's defense and support of the ASL, the dispensary system fell upon hard times, victim to financial failure, corruption, and the availability of bootleg liquor. In November 1908 Oklahomans voted to abolish the dispensary, but a court decision overturned that vote on a technicality. Nevertheless, the state recognized the futility of the dispensary as a moneymaking scheme, and in 1911 Oklahoma lawmakers passed legislation that effectively killed the institution. However, the few drinkers who had relied on the dispensary could easily secure their "medicine" through illegal means. World War I and the effective lobbying of antiliquor groups brought favorable results in Oklahoma and many other states. With much of the country already in the dry column by 1915, the ASL wanted to deliver a knockout punch to alcohol wherever it flowed. Oklahoma drys united behind this effort. In December 1917 Congress submitted a constitutional amendment to outlaw the sale of liquor throughout the United States. Oklahoma, with only eight dissenting votes in the legislature, became the eighteenth state to ratify the Eighteenth Amendment in January 1919. With the aid of a number of social and political forces, drys had now achieved their ultimate objective of national prohibition. Nevertheless, federal enforcement officials experienced difficulty policing the nation's expansive borders, and in Oklahoma the amendment did little to encourage stronger enforcement of the law. 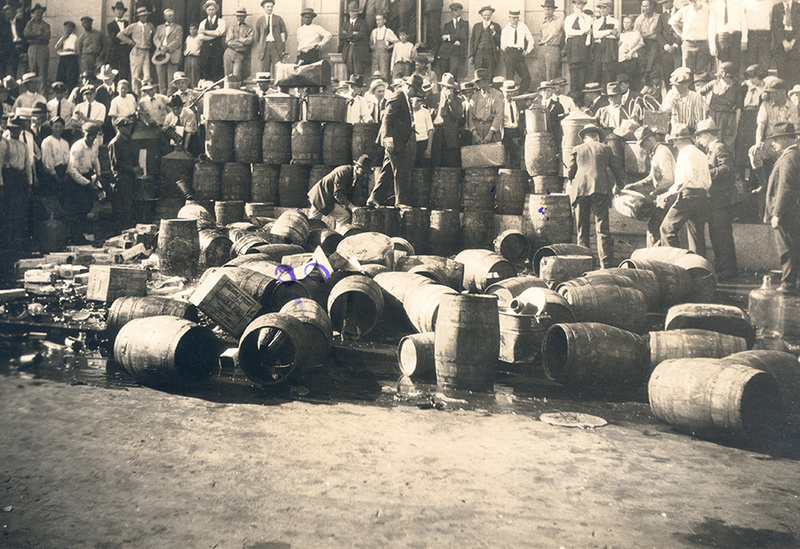 Disrespect for the liquor legislation during the 1920s fueled the wets' continued agitation for overthrowing state laws and the Eighteenth Amendment. With the election of Franklin D. Roosevelt, who favored repeal, an Association Against the Prohibition Amendment successfully pressured Congress to approve a resolution that called for state conventions to repeal the Eighteenth Amendment. Before Oklahoma could establish a convention process for repeal, in December 1933 Utah became the thirty-sixth state to ratify the Twenty-first Amendment to the U.S. Constitution, ending prohibition. Although Oklahoma was not ready to abandon the state's dry history, clearly attitudes toward liquor legislation had begun to shift. Obvious signs of change in Oklahoma came in 1933 with a proposal to approve the sale of beer. Wets argued that beer represented a chance to obtain badly needed revenue for a state hard hit by the Great Depression. More than thirty states had already approved the sale of beer immediately following repeal, and Oklahoma probeer forces made the most of that fact. They said citizens should have the opportunity to vote on the issue in a referendum. Led by a group calling itself the Beer for Oklahoma League, the legislature approved a beer referendum in summer 1933. Discounting the wets' emphasis on revenue and individual freedom, the Prohibition Thousand organization fought hard to turn back "suds," arguing that beer would mean more crime and more jails. Drys believed in their message, but Oklahomans believed more in beer and its revenue. The referendum carried by a margin of more than ninety-five thousand votes, with only twenty of Oklahoma's seventy-seven counties in the dry column. However, if wets thought that Oklahomans would now welcome hard liquor in the state, they were badly mistaken. More than two decades would pass before Oklahomans abolished the constitutional mandate against liquor. Throughout the 1940s drys fought off determined attempts to legalize liquor, but they failed to gain state legislation to outlaw beer or, at the least, to limit it to package sales. With the support of Gov. Raymond Gary, in 1957 the United Drys, an umbrella organization for the antibeer groups, initiated a local-option amendment designed to limit the distribution and sale of beer. After considerable court haggling over the validity of the dry campaign, the state approved a referendum on the issue. Again, the wets pressed home the value of beer revenue to the state, and they repeatedly stressed that outlawing beer in the various Oklahoma counties would lead to more bootlegging. Governor Gary endeavored to defeat the wet argument with his own statistics, but he and his supporters failed to convince Oklahomans. When they marched to the polls in December 1957, they administered local option a resounding defeat, with forty-three of seventy-seven counties against it. Significantly, all but four Oklahoma cities with a population of ten thousand or more voted against local option. The defeat of local option represented the beginning of the end for prohibition in Oklahoma. A shift in attitude among Oklahomans had slowly developed along with increased industrialism, more commercial activity, and urban growth. Indeed, by mid-twentieth century, the Sooner State was more than 50 percent urban. Also, a more youthful and courageous state political leadership had emerged to contest some long-standing social traditions. In 1958 Democrat J. Howard Edmondson won the governorship, committing himself to strong enforcement of the laws and to a special election on repeal. Although Edmondson faced determined opposition in pushing a repeal referendum through the legislature, he ultimately succeeded, and a vote was set for April 1959. The referendum provided for the package sale of liquor, and it also contained a local option provision. Edmondson lived up to his promise of vigorous enforcement of the liquor laws. He wanted to give Sooners the choice of voting for legalized liquor or doing without the illegal booze that so many of them continued to imbibe. Commissioner of Public Safety Joe Cannon devised an enforcement method to shut off almost all liquor supplies to the state. Drys hated to admit it, but the enforcement they had long demanded worked against them. The so-called "Cannon raids" affected convention and hotel business in the larger cities, and they annoyed some people unaccustomed to searches of establishments that sold booze. A United Oklahomans group that led the attack against the repeal referendum faced a number of problems they could not overcome. They found it difficult to raise money equal to that raised by the wet forces, and the churches that had sustained the drys in the past had split over the issue. The contention that liquor would bring significant new revenues to the state decisively impacted voters during the repeal debate, as some citizens believed that liquor sales would help avoid new taxes. On April 7, 1959, Oklahomans went to the polls and contradicted Will Rogers's adage that they would vote "dry as long as they could stagger to the polls." They repealed prohibition and turned back local option. The Liquor Control Act established an Alcohol Control Board (renamed the Alcohol Beverage Laws Enforcement Commission in 1985) that governed the manufacture and sale of alcohol. The legislation did not permit liquor by the drink, and that particular provision remained law until 1984 when the state voted it out. Prohibitionists continued to lament the passing of the old order, but as Oklahoma neared its centennial, few signs pointed to a return to the past. Jimmie Lewis Franklin, Born Sober: Prohibition in Oklahoma, 1907–1959 (Norman: University of Oklahoma Press, 1971). Jimmie L. Franklin, "That Noble Experiment: A Note On Prohibition in Oklahoma," The Chronicles of Oklahoma 43 (Spring 1965). "Prohibition," Vertical File, Research Division, Oklahoma Historical Society, Oklahoma City. Jimmie L. Franklin, "Prohibition," The Encyclopedia of Oklahoma History and Culture, https://www.okhistory.org/publications/enc/entry.php?entry=PR018.